Is it the reverse? Can we think of an event in time before it happens, in a pseudo-future that's actually now? This would mean a strong connection between the human brain (inner space) and the existence of time and outer space. Think of how unique that is! Time was born with and because of space, coming into existence one for the other, then hundreds of millions of years later, we came along - with these brains. The only organ that can contemplate itself by using itself to do it. But something is bending in time, constantly, and the answer may lie in our thoughts. You know the drill: You sing an old tune, the next day you're in the car and it's on the radio. You think about a cousin for no real reason then hear she's been in the hospital. A memory of school comes about, a week later someone asks you what your schooldays were like. You dream about someone you don't know, an hour later you meet them. You wish they'd play that old TV show you always liked, days later they do. Time has a "bend" in it, like a rubber hose bent in the middle so the ends can connect - present connected to future. Now and then we're in that area, that realm where they meet - and because time is only relative to us, it could be a minute, hour, month, year, second. We use terms like "coincidence" or deja vu yet so much can't be explained in any tossed-off fashion. Why did you sing that song on that particular day, before the radio played it for the first time in 10 years? Ancient cultures like the Maya and Egyptian knew something very basic about time - we've lost this knowledge, sacrificed in the name of modern progress. Are we abusing time? Somehow, this is important. And what exactly is a coincidence? Can we be sure it's not something we ourselves are doing naturally, with the help of time and space? The space you're in now, in time, when and how was it arranged? Why? How magnificent just to think of it all. Or....was I meant to think of this a week from now and for some reason I entered the time/space/thought realm, where everything connects? Or ... did YOU? It's one of our closest galactic neighbors, in all its splendor. It is M33, also known as the Triangulum Galaxy, and the image is courtesy of NASA's Spitzer Telescope. M33 is one of a group of Galaxies, together with our own Milky Way, which travel the universe together, all gravitationally bound. 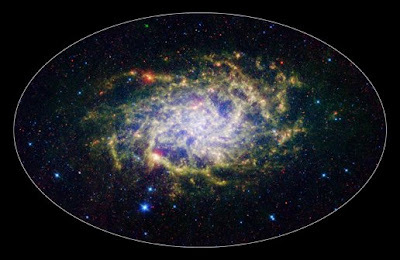 In fact, M33 is one of the few moving toward us, despite the fact that space itself is certainly expanding causing most galaxies to grow farther and farther apart. Yet this one heads toward the Milky Way. M33 is about 2.9 million light years away from the constellation Triangulum, hence its name, and when viewed with Spitzer's infrared eyes, it sparkles with color and detail. Look at all those supernovae! Imagine the storms, the winds. The stars are represented by the blue gems you see, and dust rich molecules are seen as green clouds. Those orange-red glowing areas indicate star-forming regions, and the small red flecks outside the spiral are mostly likely distant backround galaxies! Whew. It's incredible. Not only beautiful, it's much larger than first thought. I truly thought I escaped the usual hex of the ides of March, making me no April fool. But I forget the one rule of thumb for being human - nothing is absolute. Hence: Everything I touched mid-end March broke or disappeared, and I got hit with pigeon poo on 4/1, on my way to pay the newly increased rent.. Still, I love the unpredictability of life, don't you? Wish I could see Luna ... I feel like drifting in thought about stars. Galaxies. Other life.